The University of B.C.’s ice-rink staff say big safety changes could be recommended by B.C.’s regulatory body after an ammonia leak killed three people in Fernie last month. “They could test the brine more often. Normally, we only get it checked once a year. I think that would be one of their recommendations,” said Jeff Harley, the head ice-maker at the University of B.C.’s athletics and recreation department and a 20-year veteran of rink management. Brine presents a threat if mixed together with ammonia in pipes that should be kept separate. During a leak, brine can go up the ammonia pipes or vice versa, causing contamination. He also suggested that other changes could limit the amount of people in a rink’s ammonia-plant room and standardizing alarm systems. UBC’s Doug Mitchell Thunderbird Centre already has rigorous safety procedures. Staff record levels of ammonia every two to three hours and all three rinks are fitted with ammonia-detecting alarms. Technical Safety BC, the regulatory body for ice rinks in the province, is still waiting for access to the Fernie ice rink before releasing further safety information. “Once we have gathered and analysed the facts and evidence associated with the incident in Fernie, we will be able to assess if there are more steps needed to prevent incidents of this nature in the future,” said the agency’s communications staffer, Roy Siojo. The safety regulators have not suggested any major changes to current cooling systems while the investigation is ongoing. He couldn’t say when the agency might have anything to announce. “We cannot put a timeline on releasing any more information,” he said. Since the incident, Technical Safety BC has released only two statements. On Oct. 18, the agency expressed condolences to the families of the three Fernie victims who died Oct. 17 at the town’s arena. Between 2007 and 2015, there were 40 reported incidents of ammonia leaks across B.C. Nineteen of those occurred at arenas. During that time, there were 14 documented injuries, the most famous, until the Fernie incident, involving former Canadian silver medallist Karen Magnussen. The former figure skater was left with damaged lungs and vocal chords after inhaling ammonia at the North Shore Winter Club in 2011. A 2016 report from Technical Safety BC, then called the BC Safety Authority, showed a further three ammonia incidents in 2016. So far, reaction to the Fernie tragedy at ice rinks has been limited, but Harley reiterated the dangers of ammonia-based ice rinks. “It’s very, very rare to have a leak but there is always a risk with ammonia. You can die pretty quick if you get a whiff of that stuff,” he said. UBC’s women hockey players practice shooting at the Thunderbird rink. UBC chemistry professor Jason Hein agreed, also highlighting the risk. He said ice rinks will never be totally safe while large quantities of toxic gas of any type are used. He explained how ammonia becomes caustic when breathed in, dissolving in the water in a person’s lungs. It is also asphyxiating, displacing the oxygen needed to breathe, leading to suffocation. However, while any gas can technically be used as a refrigerant, Hein remained uncertain whether other feasible alternatives exist. He said ammonia remains the most cost-effective, environmentally friendly coolant widely available. 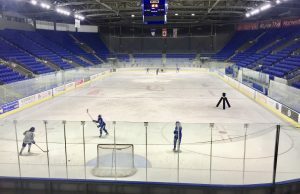 All permanent ice rinks in Vancouver use ammonia-based refrigerants like the one used in Fernie, apart from the temporary Robson Square rink that uses a glycol-based refrigerant. The public rink downtown opens on Dec. 1 and is very popular during the Christmas period. Officials at the rink were quick to stress their system does not use ammonia and therefore poses no threat to public safety. “This open-air rink uses a much different technology than the one in Fernie. This technology does not pose the same health risk. The system is glycol-based – not ammonia – and is inspected and monitored regularly by on-site engineers,” said Joanne Whittier at the B.C. Ministry of Citizens’ Service, which is responsible for Robson Square’s rink. While Robson Square may be a safer system than the majority of rinks in Vancouver, Hein still emphasizes there is no such thing as a completely safe refrigerant. If you suspect a leak at your local rink, contact the emergency services immediately and report the incident to Technical Safety BC.